The DCM-PRO Uncoupling System for electric underfloor heating combines the Heating Cable and the anti-fracture Membrane, available in fleece-backed or peel-and-stick options. It is the only UL-approved Membrane System in North America. The DCM-PRO Uncoupling System is the latest development in electric underfloor heating by Warmup. Due to load-bearing weight and structural subfloor movement, floor finishes can get damaged and tiles are especially prone to cracking. The DCM-PRO Membrane’s innovative uncoupling design results in significant protection for tiled flooring by creating a new layer between the subfloor and the floor finish. The Membrane has been successfully tested to ANSI 118.12 standards and performed well on the Robinson test (ASTM C-627). It is the highest-rated membrane for floor heating systems. The Membrane is available in two options, fleece-backed or peel-and-stick, offering great versatility for your installation preference. Both membranes can be used with the DCM-PRO Heating Cable for efficient underfloor heating. How Does the Uncoupling Technology Work? Small movements in structural subfloors caused by seasonal temperature variations can result in damage to your flooring. 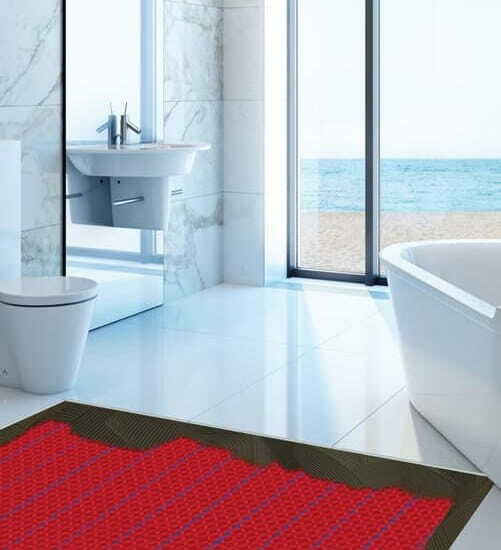 The DCM-PRO Membrane utilizes uncoupling technology so that the floor heater moves with these structural shifts, preventing and protecting your floor finish from damage caused by this movement. Patent pending adhesive layer slides and stretches with expansion. Adhesive layer contracts and self-heals if gap shrinks due to seasonal changes. Protects floor surface from damage caused by subfloor movement. The DCM-PRO membrane is suitable for use with all floor types. Its unique castellations are carefully designed to hold the DCM-PRO Heating Cable firmly in place and without the use of any tools. The patented design allows for generous cable-to-thinset contact ultimately heating faster and more evenly. The Membrane is available in two options; the Fleece-backed version and the Peel-and-Stick version. Installs in minutes with a self-adhesive backing. With an effective self-adhesive backing, Warmup’s DCM-PRO Peel-and-Stick membrane does not require any tile adhesive for it to be firmly attached to the subfloor. Simply peel off the backing from the membrane and stick into position. The DCM-PRO Peel-and-Stick membrane offers a quick and hassle-free installation of Warmup Underfloor Heating and can be installed by a qualified electrician or tiler in as little as 30 minutes. The DCM-PRO Fleece-backed Membrane features a fleece backing which can be used with any thinset to create a strong connection between the subfloor and the Membrane. The TCNA-tested Membrane can be installed on wood and cement subfloors or Insulation Boards. It provides a quick and easy installation when used as part of the DCM-PRO Uncoupling System. The DCM-PRO Heating Cable is durable and flexible. It’s ETFE inner jacket allows for high heat output while it’s PVC outer sleeve protects for a smooth installation. The DCM-PRO Heating cable is suitable for use with both Membrane options. The DCM-PRO Membrane’s castellations make fitting the Heating Cable easy, quick, and tool free! The DCM-PRO Membrane protects the secured cable from any potential damage during installation – leading to a reduced risk of cable failures. Cable spacing can vary or rotate for the highest flexibility in heat outputs to accomplish anything from Comfort Heating to Primary Heating. Whether you are installing the Fleece-backed or Peel-and-Stick Membrane, the DCM-PRO Uncoupling System is easy and quick to install. Clear the subfloor of dust and debris. When installing the DCM-PRO Peel-and-Stick Membrane, dry-fit the roll or sheets to make the necessary cuts. Clean the subfloor to obtain a dust-free, debris-free surface. We require shop-vac and ideally, wiping with a damp rag. Remove all nails, glue, and avoid OSB subfloors. When ready, peel the protective film and secure the DCM-PRO Uncoupling Membrane directly to the subfloor. If you are installing the DCM-PRO Fleece-backed Membrane, apply a layer of thinset to the subfloor or Insulation Board and immediately lay down the Membrane onto the still-wet thinset covered subfloor where required and attach it into position. The DCM-PRO Uncoupling System comes in 8 sqft sheets or 150 sqft rolls. With its unique castellations format and spacing, the Membrane offers a flexible, adjustable approach to underfloor heating layout: you can space the cable in the Membrane according to your heating and layout needs. Cable spacing will vary output from 11W/sqft to 20W/sqft. With no need for tools to install the cable, fit the flexible DCM-PRO Heating Cable into the membrane with your hands, running your thumb along the cable as you wind it around the Membrane’s castellations. Using a qualified electrician, connect to the electric source and an underfloor heating thermostat – we recommend Warmup’s 4iE Smart WiFi Thermostat for enhanced energy-efficiency. Testing the Warmup cable is essential and must be done before, during and after the installation. Watch this video to learn how to use the Warmup Alligator multimeter to test the heating cable(s). The DCM-PRO Uncoupling System can be covered with self-leveling compound or it can be tiled over directly by using tile adhesive on top of the system. The DCM-PRO Uncoupling is suitable for use with almost all floor finishes but is particularly recommended for tiled floors due to its ability to protect them from cracking. DCM-PRO Cable comes with a Lifetime Warranty. 4iE® comes with a 3-Year Warranty. Using Insulation Boards with under floor heating significantly reduces the heat-up times and running costs.